I'm the first to admit that my skill with the mattress stitch could use some work, at least when seaming fairisle. I posted that my tiny Christmas stocking ornament was finished but, in truth, I wasn't all that pleased with it. The mattress stitch was not tidy enough for my liking so I took it out and tried again, using the back stitch. I was even more unhappy with the results. Since I really wanted to give this stocking as a gift I was particularly determined to be proud of it. So, I rethought and reknit. This time I knit in the round = no seam except for the back of the heel. I used the mattress stitch there and it looks fine. 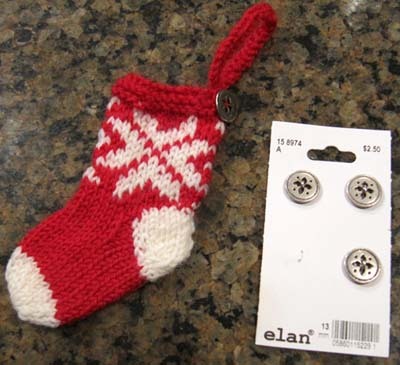 The snowflake design is now centered on each side of the mini stocking. When I seamed with the back stitch it was not. I hadn't added a button to the first stocking as I hadn't found buttons to my liking. On a visit to Fabricland I found little silver-y/pewter-y buttons that, in my opinion, are perfect. I tossed the first incarnation of the stocking in the garbage. Now that I've got the stocking that I'm happy with I've had a request for another. I like making these stockings very much and I have a feeling that I'll be knitting more than just one more in time, maybe even for myself!